The first time I made ricotta I was blown away how simple it was. That said, it doesn’t work out particularly cheaper to make it yourself. 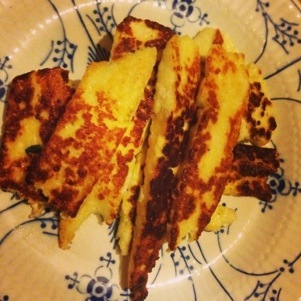 Haloumi however seems to be a different matter. I saw this recipe on the Guardian website & was struck that what is probably my favourite thing to BBQ looked so simple to make. Apart from usual kitchen things all it needs it vegetarian rennet & a thermometer. I bought both of these on eBay for about $6.00 each & of course they can be used again. The milk I used was a gorgeous 2L of Jersey milk short dated @ Harris Farm and therefore on special for $3.64 – made just over a usual packet size of haloumi – not bad value overall. I followed the recipe exactly so I won’t repeat it here, but I do want to recommend you try it. I did however make it 1/5 of the original size, who buys 10 litres of milk? 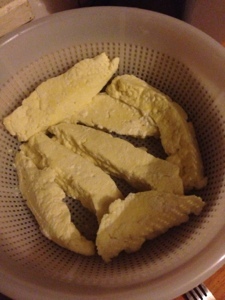 Here are the drained curds before the final poaching stage. And the end result fried and golden and glorious. 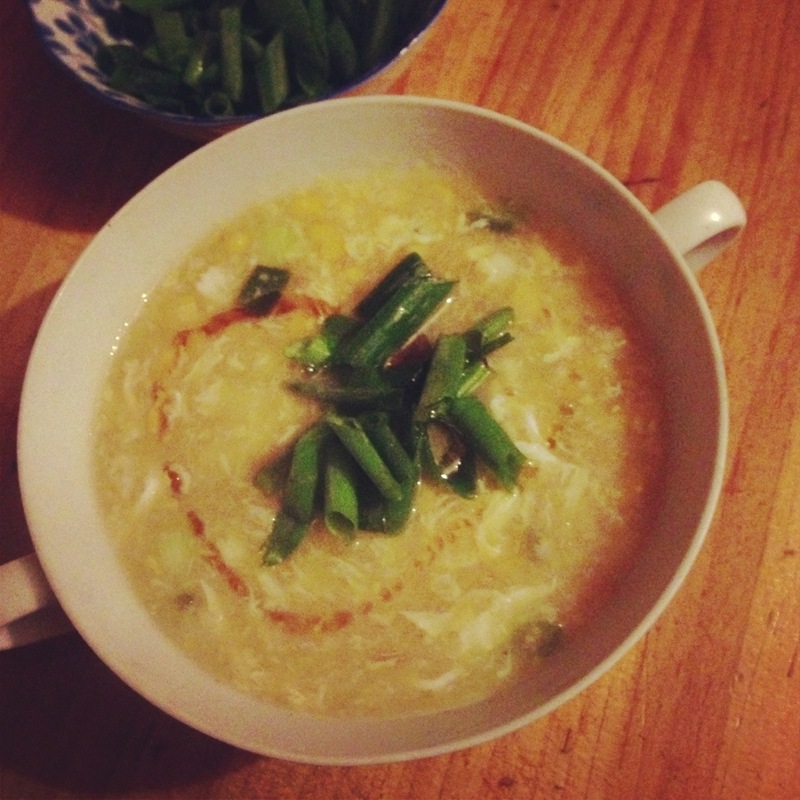 And here’s a link to the recipe again. Bookmark it for later? Don’t forget to save the whey, it can be used to make a particularly nice & I fussy ciabatta. Making treats for work morning tea at my office has a few challenges: one person is no nuts, one is vegan and my kitchen has no food processor or other appliances. Challenge cooking is my favourite though, so no problem! This time ended up making my new favourite super food treat, it’s easy & quick, not much washing up & you may even have everything for it in your cupboard and fridge. 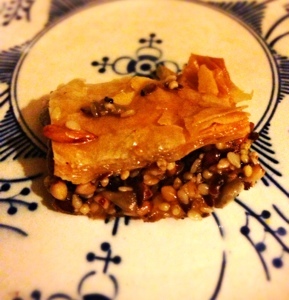 It’s vegan nut free baklava. Yes. The secret ingredient is Kapai Puku, a seed blend that is my favourite for porridge or gorgeously chunky Bircher muesli. It’s also wonderfully nutrient packed, great for marathon training season refueling. I used the original blend, but any of them would work. This is my first time making more than breakfast with it and I am hooked. It ain’t cheap but it is jam packed full if goodies. I got mine at David Jones Food Hall, but most health food stores would stock it & you can buy online. I considered using vegan butter but really it’s just oil with additives, so I just used oil – still got a lovely crunch to the pastry. 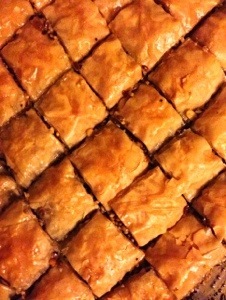 Brush each sheet with oil & layer half the pack of filo into the baking dish. Top with Kapai Puku then layer on remaining pastry. Cut into diamonds, or squares if you’re me & find diamonds too complicated. Bake at 160c for 20 mins, then sprinkle on 2TBS of cold water. Bake another 15 minutes at 200c. Heat up on medium till sugar is dissolved & the whole thing is thickened a bit. Add a squeeze if lemon at the end. When pastry is done baking pull it out & pour over the syrup. Cook and eat. This is the easiest back of the cupboard soup recipe. The result is sweet and warming & a lot more special than it has any right to be. Quantities entirely up to you, add chilli oil at the end if you want an extra kick. 1. Fry ginger, garlic, white bit of shallots in sesame oil till soft. 3. Bring to boil, add in one whisked egg, stir to mix it through. 4. Garnish with sesame oil (or chilli oil) & chopped green shallots.